Epigenetics is a rapidly growing field in biology and cancer research. While the underlying genetic code defines which proteins and gene products are synthesized, epigenetic control defines when and where they are expressed. Epigenetic control is often mediated by methylation of cytosine to 5-methylcytosine (5-mC) in CpG islands, but other types of base modifications are possible, and their regulatory importance is currently under investigation. Methylation and/or hydroxymethylation of CpGs near promoters is associated with gene silencing, and has important consequences for gene expression by contributing to the re-modeling of chromatin via recruitment of methyl-CpG-binding domain (MBD) protein complexes and subsequent chromatin modifiers. Disease phenotypes have been shown to arise when these activities are perturbed, resulting in undesired gene expression. Whole Genome Bisulfite Conversion (WGBS). 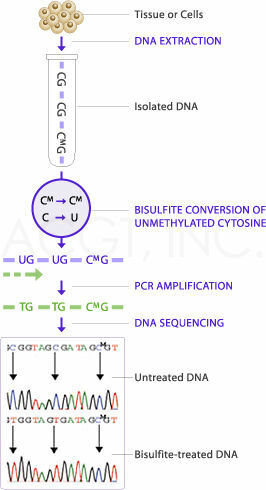 Chemical treatment with bisulfite converts non-methylated cytosines into uracils that are converted to thymidines after one round of PCR. 5-methylcytosines remain unaffected. After mapping, this can be used to identify the positions of all 5-mCs in the genome. The disadvantage of this approach is the vast amount of sequencing that is required for large vertebrate and plant genomes (see Table 1 in Important Considerations). Currently, ACGT offers WGBS analysis using EpiGnome™ Methyl-Seq Kit from Epicenter/Illumina® as well as similar kits from other providers. Affinity-based isolation of methylated DNA. The application of the affinity-based technologies is an efficient way to differentially and specifically enrich 5-mC sequences from complex sources such as genomic DNA. In brief, genomic DNA from cultured cells or tissues is prepared, sheared, and then denatured. Then, immunoselection and immunoprecipitation can take place using the antibody directed against 5 meC and antibody binding beads, or a bead-linked MBD protein. After isolation and purification is performed, the IP’d methylated DNA is ready for any subsequent analysis by next generation sequencing in a manner similar to ChIP-Seq samples (see Important Considerations and Sample Submission Guidelines). The output is the comparative abundance of various sequences, suggesting their level of methylation in the sample relative to other samples. Currently, our preferred approach (MBD-seq) uses a methyl binding protein to pull down methylated DNA (using MethylMiner Methylated DNA Enrichment kit or equivalent). Dr. Semyon Rubinchik, Scientific Director, discusses the service of DNA Methylation Analysis.